Sustainability is a concept that has wide applications. Presently you often hear it used in the context of environmental programs. However, “sustainability” can be applied to a wider band of disciplines, such as sports. Here in Canada, at the 2010 Olympics, the idea of sustainable podium performances is what defines their Own The Podium program. Jenn Heil, the Canadian Team’s first claimer of Olympic metal, stated consistently that “Own The Podium really gives us the support to win the medal for Team Canada.” Heil gleefully announced at a February 14th press conference that “Canada’s medal train has now left the station!” She will be awarded the Silver at this evening’s first 2010 Olympic Games medal ceremony for her mogul skiing performance at last night’s Cypress Hill competition. Follow the Canadian Team on Twitter: COT_ALL_UPDATES. Own the Podium is an innovative and collaborative initiative without precedent in Canadian sport. It was created to bring together the key parties involved in leading and funding excellence in Canadian sport, with specific emphasis on achieving excellence at Summer and Winter Olympic and Paralympic Games. Kristi Richards, also an Olympic Contender, and the 2007 World Champion for women’s moguls, has put her momentum behind sustaining athletes by starting her own “Supporting The Dream Legacy Fund.” She explained that her hometown of Summerland, B.C. stood so strongly behind her while she developed as an athlete that she decided to start a foundation which has the kids fundraising for themselves. “Through the Adopt An Athlete program, I actually turned it back around for the kids. I help them fundraise and then the funds go back to develop them as athletes.” Her program is known as the I Can Be Legacy Fund. She showed true Olympian sportsmanship, taking her competitive crash in stride and acknowledging that it allowed her “a second start. I got to get the crowd excited again.” She’s also a supporter of the 1 Step Foundation, a sports oriented environmental foundation. On this Valentine’s Day 2010, love is in the air. Love for team, love for country and love for the competitive spirit of athletes,… that spirit that pushes us, as the human race to achieve unprecedented excellence. Prime Minister Stephen Harper has invested a personal presence to these historic winter games. He has shown up at the Olympic Village to galvanize his team to win gold and bring home medals for Canada in 2010; he also “waited for about 10 minutes in the rain, with his daughter” to congratulate Jenn Heil on her win, she said, the heartfelt appreciation apparent on the athlete’s face. Appreciation, recognition and support are all ingredients that form the alchemy of sustainability. Prime Minister Stephen Harper and wife Mrs. Laureen Harper, along with the Right Honorable Michaellle Jean, Governor General of Canada, whose official duty it was to open the Olympic Games of 2010 in Vancouver, hosted heads of state at an Olympic Reception just prior to the opening ceremonies in downtown Vancouver Feb. 12th. Faster, Better, Higher…than has ever been attained by human beings before… is what these assembled Olympians, from across the globe, are here to achieve, the Prime Minister reminded the gathering at the special reception hosted in the city’s downtown Fairmont Hotel. Just below the second story windows, a crowd of several hundred protesters to the games had gathered just prior to Opening Ceremonies. Thousands more, all suporters of the games, jammed the streets, decked out in Canadian flags, Olympic Gear, their country’s colors and maple leafs on their way to watch live or view on humongous outdoor/indoor screens peppered across the city, the Opening Ceremonies to the games. Dignitaries on hand included Gov. Arnold Schwarzenegger and V.P. Joe Biden and his wife Dr. Jill Biden. Dignitaries and representatives from other countries in attendance included Belarusse, Czech Republic, Estonia, Georgia, Latvia, France, Netherlands, Russia, Switzerland, USA, Denmark, Norway, United Kingdom, Cayman. Canada’s P.M. Stephen Harper welcomed the international delegation to “one of the most beautiful and livable cities in the world,” speaking in both French and English. He cited the feel-good example, being used concurrently in a running Visa commercial, of the Turin Games’ Sarah Renner who broke her ski pole and was then aided by the Norwegian Olympic coach who sprang forward to lend her his. This type of sportsmanship is what sports should be all about, he concluded. The somberness of the day’s events, however, were not to be ignored. Canada’s Harper ended his greeting to his international guests by observing a minute of silence in respect for the Georgian Athlete. These values have been expressed in more than words. For the first time in Olympic history a third brand, the brand of the Four Host Nations Society, in addition to the IOC and the host city of Vancouver – has been allowed official Olympic communications. 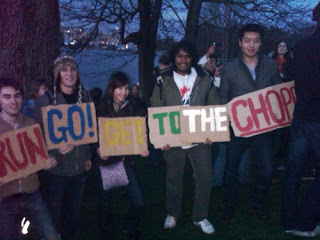 For Shawn A-in-chut Atleo, current national chief of the Assembly of First Nations, this is significantly meaningful. “These games are about sports, arts and our culture. It’s about bringing it all together and putting it out there for the world to see. This is what these Winter Games are all about for us.” He spoke to guests gathered at a fashion show celebrating First Nations fashion designers Dorothy Grant, Pamela Baker and Angela DeMontigny on February 13th just as Jenn Heil was winning silver for her country. During this hyper-competitive time, when countries from around the world are assembled to display the zenith performances of their athletes, Canada once again displayed its quality for compassion when the crowd of Maple-leaf-bearers began to applaud for U.S.’s Hannah Kearney who took gold this round after finishing 22nd in Turin. At today’s unveiling of Olympic Rendezvous at Samsung (OR@S) Gerhard Heiberg of the International Olympic Committee stated with full confidence, “We chose the right place,” when referring to Vancouver, B.C., in which to hold the Winter Games. Except maybe, for the weather, he quietly added. Ironically, the unusually mild 2010 winter that the city is experiencing gives the greenies a great backdrop to drill down on the point of global warming. “We were on Cloud 9 when we were awarded the games back in 2003,” stated Premier Campbell at the Samsung WOW Rendezvous launch, attended by Super Athlete, Wayne Gretzky. Amazingly, as recent as 2003 there was still debate about the “real” or “imagined” existence of global warming. Enter The Offsetters: Offsetting the Winter Games one ton at a time. So while headlines point to the trucking in of snow for the Winter Games, these kids from Kelowna, Canada dreamed up a new Olympic sport for our ever-evolving Earth. Of course, they did so tongue-in-cheek and in conjunction with OffSetters, a carbon offsetting company founded by two University of British Columbia professors. Offsetters is encouraging every Olympic attendee and guest to do their part in offsetting their impact on the globe during the games.Calculate your Impact Here. The 2010 Winter Games’ footprint will be an estimated 118,000 tonnes of direct carbon emissions – all emissions that are directly attributable to the 2010 Winter Games like venue construction, facility heating, and athlete travel. Additionally, this event will produce 150,000 tonnes of ‘indirect’ emissions – emissions that are largely attributable to flights and accommodation for spectators, media, corporate sponsors and their partners. As humorous as this is, the concern is real. Snow is being trucked in, flown in, bussed in to Cypress Mountain. Come Friday the Winter Olympic’s first event, women’s moguls, will need snow. Below, VANOC CEO, John Furlong, is escorted off the tarmac in downtown Vancouver after a look-see flyover the Sea to Sky route which is the Whistler to Vancouver road. At Samsung’s Rendezvous Furlong said, “When the torch arrives here tomorrow evening, life as we know it will change. More than anything we here in Vancouver want to leave behind the positive legacy that the power of sports can change lives.” Let the snow, er, games begin. Have an Eco Idea to share? Jump into the Games.